Both Semi Final pairings saw convincing 2-0 sweeps for the winners, as ORACLE Racing Spithill and Energy Team advanced to the Final of the Match Racing Championship at the America’s Cup World Series. 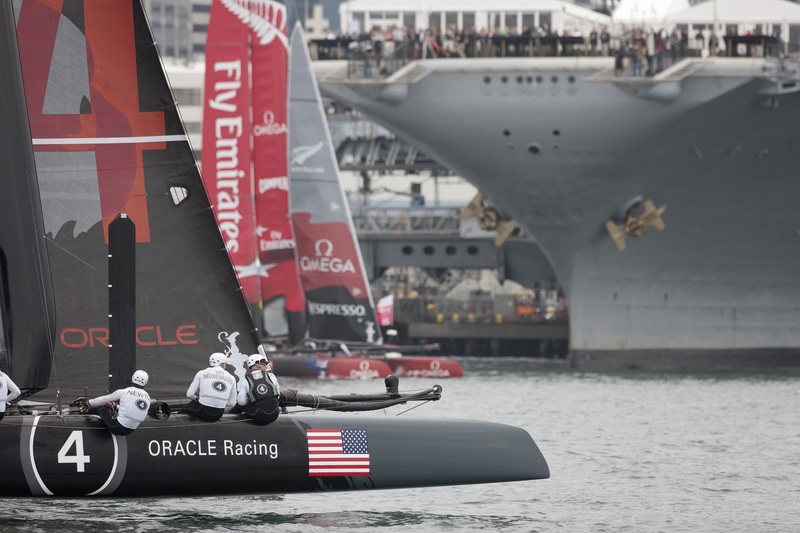 The first Semi Final pairing featured two heavyweight teams – Emirates Team New Zealand and ORACLE Racing Spithill who came into the regatta as the top ranked crews on the World Series leaderboard. On Friday, it was Spithill’s team who won the first race in the pre-start, pushing the New Zealand boat over the starting line early and then leading the Kiwis around the race track after they paid off their start penalty. The second match was closer, with Dean Barker’s Kiwis winning the start before Spithill escaped a tight New Zealand covering position to find a pleasing wind shift on the left side of the race course to move into the lead. 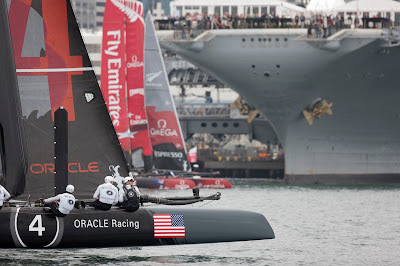 With team principal Larry Ellison on board for both races, Spithill and crew swept their way into the Final. In the second Semi Final, Energy Team trailed early in both races before using a similar passing move on the first downwind leg. With Artemis Racing leading the two boats towards the course boundary, new Energy Team skipper Yann Guichard was able to gybe his boat inside the Swedish challenger in both races, each time getting a favorable puff of wind at a critical moment to power ahead of Artemis to make the pass. From there, Energy Team extended in each contest to advance to the Match Racing Final on Saturday. In contrast, Artemis Racing skipper Terry Hutchinson could only take solace in his team’s overall sailing performance, if not the result. “If the guy behind gets some more wind and you don't, then that's the advantage of being behind. But I'd always take being in the lead first. Other than the finish line, I was happy with about 80 percent of the day. But the 20 percent I'm unhappy with, there's a lot of room for improvement. 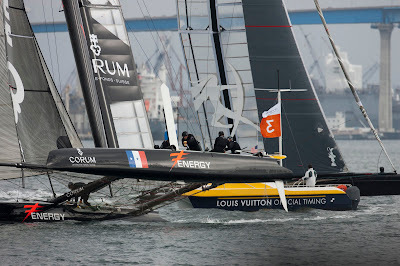 We have some great sailors on our team and we have to keep on working on it." Friday was Healthy Ocean Day at the America’s Cup World Series in San Diego, featuring a full day of public programming as part of its global ocean awareness program. The America’s Cup Healthy Ocean Project Hall features hands-on exhibits from leading ocean conservation educational organizations such as San Francisco’s Exploratorium and Scripps Institution of Oceanography, as well as the Washed Ashore educational touring art exhibit focused on marine plastic debris. While on Friday, the main stage featured a multimedia presentation from leading oceanographer Dr. Sylvia Earle and other ocean healthy advocates.